I Forgive Myself, I Move On. Today, I was amazed at how I felt when I said to myself ‘Yeah Jaachi, you shouldn’t have done that; but I forgive you’. This will be the first time in my life that I’ll ever say these words out loud to myself. On every other day before today, I just deliberately ignore whatever it is I had done and consciously forget about it – but today, I said to myself out loud ‘I forgive you’. Many times, we beat ourselves up over stuff we cannot change. We become too sad because we feel like we have disappointed ourselves by doing some things we ought not to have done – This is wrong. 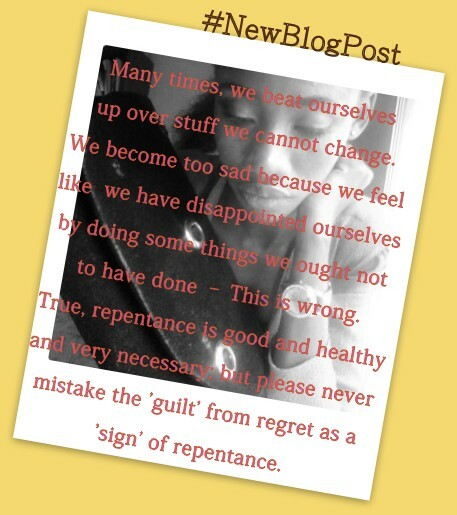 True, repentance is good and healthy. And in fact it is very necessary; but please never mistake regret for repentance. Regret is something way different; it is unhealthy and pointless and just isn’t right…it wears you out. It births worry, it births guilt, it births self-hate, it may give you a feeling of constant disappointment in yourself, and worst…it births a low self-esteem…and you see, neither of the above mentioned is God’s will for you – or for us. In living, I have learnt that life is beautiful, and other days funny, and other days boring, and other days magic, and sometimes…just plain disappionting. I’ve learnt that moving on is a way better thing to do than staying or sleeping on some wrong that I have done in the past or whatever. I’ve learnt that happiness is a choice; and so is unhappiness – in fact, almost everything in life is a choice. And so every day – as much as you can, do choose to be happy. Do choose to forgive yourself. Do choose to move on. I hope you know that happiness will NOT just jump on you; like I said earlier: it is a choice. Choose to remember that you have all that you need. You have a Father on whose Love you can bank on and trust in 24hours a day, 7 days a week…and that is all that matters, really. I strongly believe that the words ‘I forgive you’ aren’t only meant to be told to people who have hurt us, or whatever. Some days, we also have to say these words to ourselves – call out our own names, and tell ourselves ‘I forgive you’. ‘That was a really stupid thing you did but, I forgive you’. ‘You know you should have done it better but, I forgive you’. Every day, we grow. And every day, we learn. And as the days go by, we find and learn more about who God is turning us to be. And in some of our learning processes, we may do really stupid things, and sometimes may get disappointed in ourselves because we know we should have done it better, or said it better; but c’mon – life goes on! This post of course is not something I’m writing to give us an excuse (or encourage us) to keep making silly mistakes, or to keep repeating the same wrong thing over and over. No. Instead, it’s something I’m writing to help us understand that we all are growing (in Christ) daily into Maturity (Eph 4: 13)…and I don’t know how long this growth is going to take; but I know that we all are turning into something really beautiful; there may be falls and trips and slips and scars and what have you; but remember that these all make us stronger and wiser and braver. We must learn to be happy people, we must choose to want to grow, and learn to see ourselves through God’s eyes. We must learn to make peace with ourselves and we must learn to forgive ourselves, since we all already, have been forgiven by God. Thank you dear. I love that God spoke to you through this article; it’s such a joy to know that, really. You’re amazing and God bless you! This is my first time opening your blog and then I randomly stumbled on this. Many a times, we (rather, I personally), do so many wrongs then I get mad at myself and beat myself over it for years..
Bt after reading this, I’m gonna learn to forgive me, have a free mind and conscience. The past doesn’t matter anymore. Jaachi, this is the first time I’m opening your blog, then I randomly stumbled on this post. Many a times we or rather I personally, do so many wrongs then I get mad at myself and beat myself over it for years, this sequence continue for every wrong I make. Leaving me with a desk piled with filled pages of my wrong doing waiting to be marked (judged). Yeah, no need to beat yourself about the past, move on! Life is beautiful! God has not only forgiven, He has forgotten…but He expects us not to repeat our mistakes over and over.💙 Thank you for stopping by on here. My pleasure.. See you soon in school.